Since his untimely death by suicide at the age of forty-six in 2008, Wallace has become more than the representative writer of his time — he has become a symbol of sincerity and honesty in an inauthentic age. His reputation and reach grow by the day. Max takes us from Wallace’s early years as a child of the 1970s in the Midwest to his hothouse success in his twenties and subsequent collapse into depression and drugs, and from there through his painful reemergence as an apostle of recovery, ending with his triumphant novel of addiction and redemption, the book of the decade, published when he was just thirty-three. 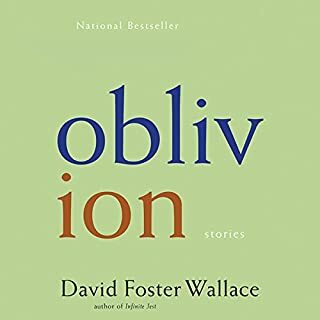 But Infinite Jest itself left as an open question what should come next, as Wallace sought hopefully — and then, increasingly, helplessly — for a way forward, stymied even in the midst of the happiest personal time he had ever known. Max guides us on this remarkable literary and spiritual journey, this prolonged exploration of what it means to be human. Wallace was coy with the press and very private, yet the concerns of his writing and the struggles of his life were always closely intertwined. In illuminating the life, Max enriches our understanding of the work. And in his skillful, active investigations into Wallace’s prose, he reveals the author in unexpected ways. ©2012 D. T. Max (P)2012 Brilliance Audio, Inc. Probably not. First of all, I don't have too many friends who are as rabid a David Foster Wallace fan as I am. I don't have too many friends who are DFW fans period, at any level of rabidity. However, (secondly) if I did, I would probably recommend they read the actual book instead of listening to the audiobook. The loss of the (copious) endnotes from the audio kept me going back to the physical book daily to read what I'd missed. I think the producers of this audiobook should have found a way to include them. There were some real gems buried in those notes. For instance, the title is only mentioned/explained in an endnote. Being (as I am) a rabid DFW fan, I liked best the parts that described his writing experience, especially around the creation of Infinite Jest. What three words best describe Malcolm Hillgartner’s performance? Let me just say this: the performance was fine, mostly, but I noticed that there were passages, single sentences here and there, that were re-recorded (the tone of voice and background noise changed audibly for an entire sentence and then resumed back to normal afterward) and then I realized that every time this happened, the sentence contained Jay McInerney's name. * Seriously. Every. Single. Time. Then I figured out what had obviously happened. After the entire recording was done, someone realized that Hillgartner had mispronounced McInerney's name all the way through. The index (in my printed copy) shows that McInerney appears on 13 different pages, so that's at least 13 different sentences that needed to be re-recorded and spliced back in. I found that off-putting, to say the least, although (admittedly) a minor gripe. However, besides that and to repeat myself, I thought Hillgartner's performance was fine. He did an especially good job of "voicing" DFW himself during passages where his own writing was quoted. * McInerney wrote Bright Lights, Big City back in the 80's and was a person whom DFW followed during his early career. Sure. Any time DFW went off his meds. And obviously the last few pages. If you're going to listen to this, get a copy of the actual book and follow along. The endnotes are worth reading. A good solid biography of David Foster Wallace. For a writer who was so hyped, celebrated and written about, it was a nearly impossible task to bring anything large or significant to the table with Wallace. D.T. Max did a good job. He didn't write a hagiography or sycophant's biography, but also avoided sinking into a loop of cheap theatrics that might have tempted another biographer. It wasn't a revolution as far as DFW was concerned or as far as biographies of writers either. For me, it was like seeing a favorite movie star on a large HD television. You are suddenly aware of many flaws that had been hidden before. You see things that were hidden, or at least not obvious before, but it doesn't alter your perception too much. In Every Love Story is a Ghost Story, Max shows a DFW that is more insecure and conflicted than a superficial glance might portray. 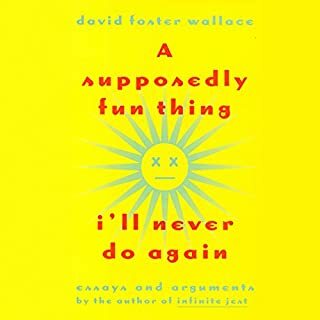 Wallace's self-conscious tendencies to enthusiastically bend the truth with friends, coworkers and family and to claim achievements (perfect SATs, etc) that were not his, but to second guess and be discomforted by those achievements that WERE his (Guggenheim Genius grant) was a valuable shading to the DFW myth. D.T. Max neither polished or defaced the statue of DFW life and achievements. He simply turned the statue and revealed another dimension to the man and his infinite genius and infinite sadness. DT Max has done a wonderful job recounting the basic facts of DF Wallace's childhood, youth and young adulthood as a Midwestern genius struggling to express himself, understand and be understood. 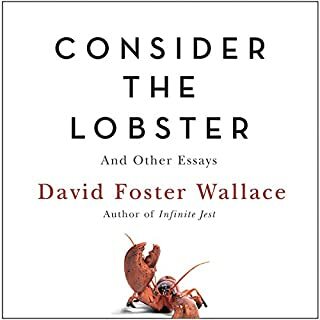 Wallace's thoughts and imagination are so complex it's amazing he did as good a job as he did making himself understood to us lay people, even the really smart ones he met and befriended at Amherst as an undergraduate. The quality of his undergraduate papers is just astounding; more than one professor called him the best student he'd ever had. The toll his severe depression took on his creativity, energy, and productivity is hard to read about. Why wasn't there a better treatment available? What more would this great mind have been able to give us had he not been so grievously afflicted with a severe and unrelenting mental illness? 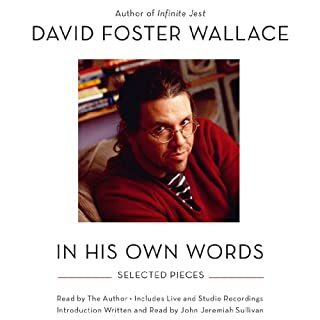 I've listened to two audiobooks (Brief Interviews with Hideous Men, and Consider the Lobster) read by DFW himself, and imagined that I was getting a glimpse into the author's powerful mind simply by hearing his voice reading his own words. DT Max's story of DFW's life--his studies, his interests, his girlfriends, his addictions and recovery, his struggles to finish writing the two "long things" he worked on--provides another glimpse. 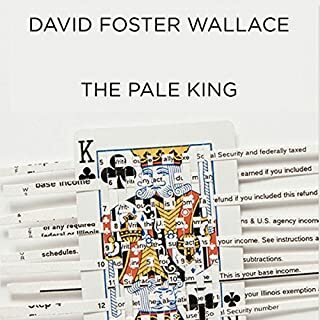 Wallace died at 46, his last "long thing" (The Pale King) unfinished but organized enough that his editor published it anyway. His life was not easy but he seems to have found peaceful places from time to time, and he left us with an amazingly rich body of work, both in fiction and essays, despite his troubles. Thanks to DT Max for explaining some of the circumstances of Wallace's journey and giving a context for some of his best-known and best-loved work. 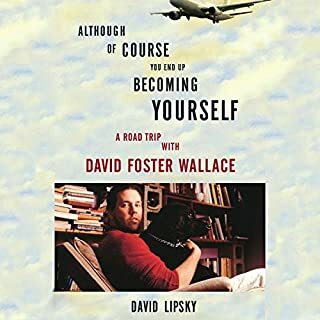 I'm going to listen to David Lipsky's account of a road trip with DFW next. The biographer of Wallace’s life, D. T. Max, works as a staff writer for “The New Yorker”. Dave Eggers, Tom Bissell, and Evan Wright (authors in their own right) say that Max delivers a history of Wallace that is ‘well researched’, ‘hugely disquieting’, and ‘indispensable’ in knowing Wallace and why he will be missed. One is inclined to agree with all of the former, but may question the latter; i.e., will Wallace’s writing be missed? If one did not know anything about Wallace, after listening to “Every Love Story is a Ghost Story”, the uninformed becomes well-informed. Wallace is a smart, well-educated, germophobic heterosexual that drives for literary success with a manic-depressive intensity that is played out in his writing and ended by his suicide. His life is celebrated by academic success but marked by drugs, unhealthy human relationships, rehabilitation, and recidivism. He is shown to be an excellent professor of literature and an interesting conversationalist when his head is in the “game”. But, he is also shown to be violent and allegedly capable of planning a murder when his interest in a married woman (Mary Karr) is thwarted by uncertain divorce in a troubled marriage. At the very least, one is compelled by Max’s biography to give “Infinite Jest” another chance to impress; maybe the fault is more in the reader than the writer. In this life, in this world none of us get out alive. The Thing, the Blackhole of utter despair takes no prisoners, only casualties, and with no emotion, no remorse. His was not a life well-loved, it was a life well-battled, and, then, also it was a life celebrating the hidden gems of love, community, commitment and endurance. And so, in its glorious brilliance and darkest shadows his life will leave us all knowing that living can only be a 3D experience, not a tightly written narrative with all the loose ends bound up in tidey little knots. DT Max did a great job capturing DFW's brilliant life and mind. I particularly liked the way Max captured Wallace's character through well-chosen quotes of his fiction, nonfiction, and letters. I also appreciated Max's focus on Wallace's life rather than his suicide. 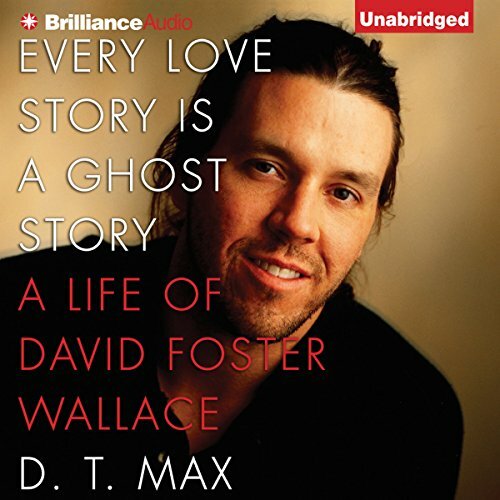 The narrator was able to capture the various moods of Wallace throughout his life, which made the listening experience very enjoyable. It doesn't get any less sad or intriguing... Narrator is great. Story is a must know/hear. A deep and telling look into the life of a complex writer struggling with his own limitations and hubris. Fantastically done!